According to Feeding America, 41.2 million Americans live in food-insecure households, including 28.3 million adults and 12.9 million children. The majority of people who are food insecure do not live in poverty, and the majority of people who live in poverty are not food insecure. People are struggling to get by because of underemployment, stagnant wages, and rising costs of living. When we started working with organizations such as the Food Bank For New York City (FBNYC) a few years ago, I had no understanding of the magnitude of this issue nor did I have any idea of the scale on which Food Banks are operating. The FBNYC is supporting 1.5 million New Yorkers in need through a variety of programs. Hunger exists. Sadly, it is a real fact in a country that is the main food producer in the world. Many Americans are faced with tough decisions, such as whether or not they should pay a utility bill or put food on the table? As a father, I cannot fathom having to make that decision. The thought that I could not feed my own family is horrifying. This is a situation that I don’t feel any person should have to face. Being hungry, going hungry is a dire situation in America, and throughout the world. People who are hungry are often unable to solve any additional problems they are experiencing as long as hunger continues. 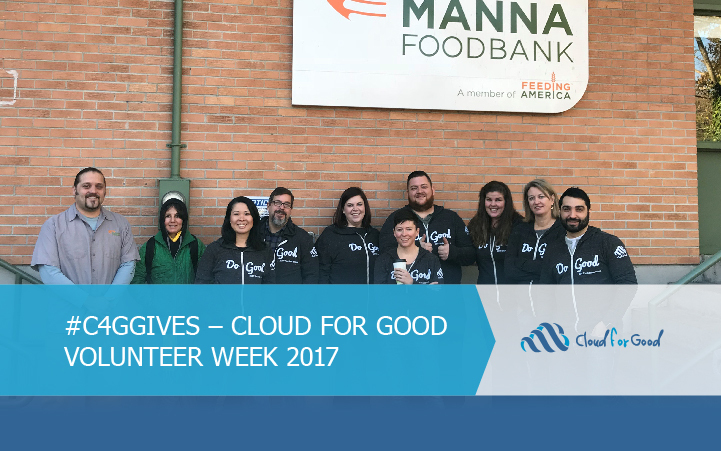 This year we started the Cloud for Good Volunteer Week, a week where our virtual workforce gives back to the community as part of our participation in Pledge 1% and our Corporate Social Responsibility Program. Our team volunteered at 17 food banks around the world including the Los Angeles Regional Food Bank, Newmarket Food Bank Pantry in Ontario, Canada, and the Amsterdam Food Bank in the Netherlands. Our Goodies helped in variety of different tasks. We packed food bags, sorted meat, and packaged thousands of bags of pasta. Below is a complete list of organizations where we volunteered. I am very excited to announce that with the hours completed during our volunteer week, Cloud for Good reached 1,000 volunteer hours given as part of either group or individual volunteering hours covered by our Volunteer Time-Off policy. “The best part about working at Cloud for Good is knowing the work you do every day contributes to our mission and the missions of the nonprofits we serve. Volunteering at Midwest Food Bank allowed me to participate in that impact directly and gave me first-hand insight into how I can build Salesforce to help them best serve their communities,” said Kelsey Henneboehle, Cloud Consultant. “Getting out and volunteering in my community reminded me of the days I spent working at a nonprofit. As the volunteer coordinator took the time to make sure we all understood the far reaching impact of volunteer efforts, it reminded me how rewarding it felt when I was able to engage with volunteers and walk alongside them to accomplish a task. An added benefit of volunteering was being able to spend time with other Goodies located near me. We see one another periodically but this was the first time we gave back together, it was fun and for a great cause,” stated Terimarie Degree, Operations Associate. Thank you to the team at Cloud for Good for being so dedicated to community, service, and a world that includes more than just themselves. I am humbled to be part of this team.